Los Angeles has a great homegrown rock & roll history, with influential bands like The Seeds and Love. The Jigsaw Seen is an L.A. group that adds to this tradition with wonderful, 60s inspired music of their own. 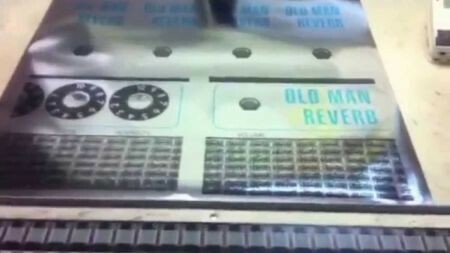 Old Man Reverb, the title of The Jigsaw Seen’s latest album, is one of the best album titles of the year. ‘Reverb’ is an electronically produced echo effect in recorded music, and if you Google ‘Old Man Reverb,’ you’ll come up with just as many Paul Robeson Ol’ Man River (from the musical Showboat) as The Jigsaw Seen search listings, which is most likely intentional. The album combines cynicism and joy in a sneaky way. “Die Laughing,” for instance, has an exuberant groove, with a piano trill that sounds straight out of Elvis Costello’s Imperial Bedroom. The band has said they were attempting something that sounds like The Who being produced by Phil Spector with this track, which is actually impossible to imagine. Nevertheless, the result is topnotch. Songs about death – in this case, concerning dying laughing -- have never felt so celebratory. “We Women” sounds like one of Tom Petty & The Heartbreakers’ more rocking tunes. Seemingly about women in music, it’s a fun song that includes a snotty vocal that is part early Alice Cooper, part a kinder, gentler Ramones. (As you can see, there are tons of rock references in this music. It’s intentional, and a whole lot of fun for music nerds to pick them all out). While this is an especially guitar-centric album, one called “Hercules and Sylvia” includes some really pretty string work. It’s also impossible not to love the twang-y, cowboy sounds that drive “Abide.” The album ends with “Grief Rehearsal,” a sad, kinda country song. Yes, The Jigsaw Seen is a band that unashamedly lets its musical influences show through. But for those that love rock & roll history the way Civil War buffs dig battle reenactments, the songs on Old Man Reverb are both revelatory and comforting. Let there be reverb, and long may it live!